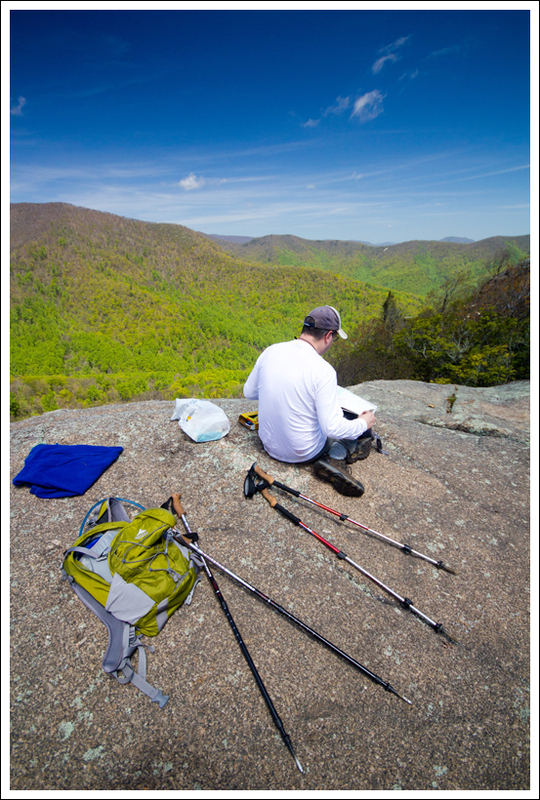 Bear Church Rock is a 8.5 mile hike that leads to gorgeous, mountain views. The hike passes alongside two rivers, waterfalls, and a PATC cabin. 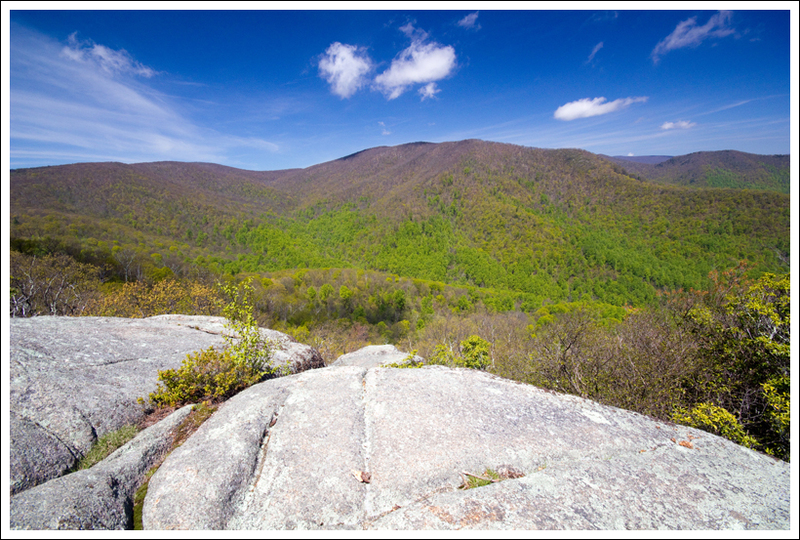 You can also reach this beautiful overlook from Skyline Drive (Bootens Gap). Adam enjoys the view from Bear Church Rock. 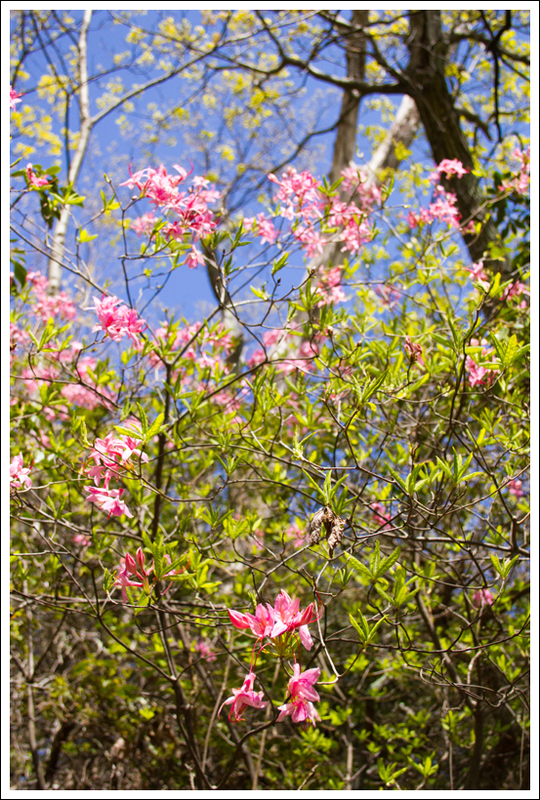 Below: The tall, straight trees along the Staunton River trail were very beautiful; Azalea blooming near the top of Jones Mountain; The last push to the rock almost killed Adam. Bear Church Rock is a hike that has it all – nice trail alongside a stream, a few small waterfalls, a visit to a PATC cabin, and a great view at the top. The views are completely of mountains with rarely a sign of civilization. I always feel like I am truly getting away when I don’t have to see houses or roads dotted across the landscape. 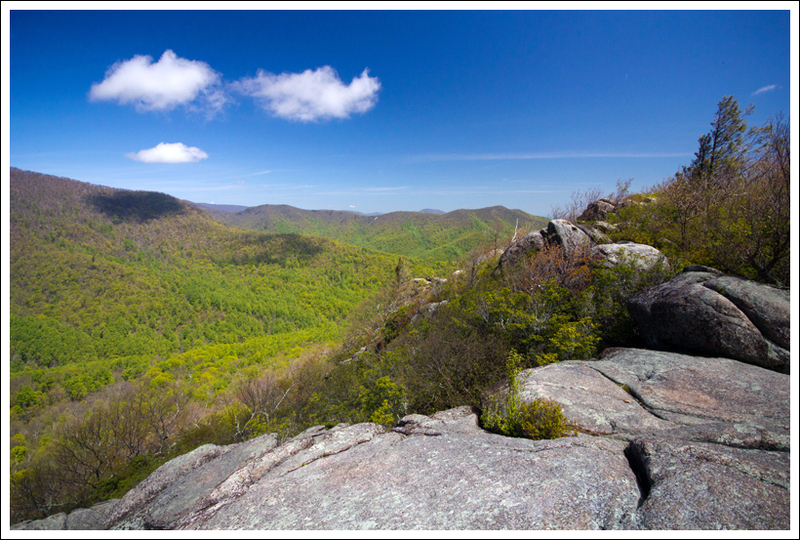 You can easily see Fork Mountain and Doubletop Mountain nearby, but past that ridge, you can also get glimpses of the ridge that makes up Skyline Drive. 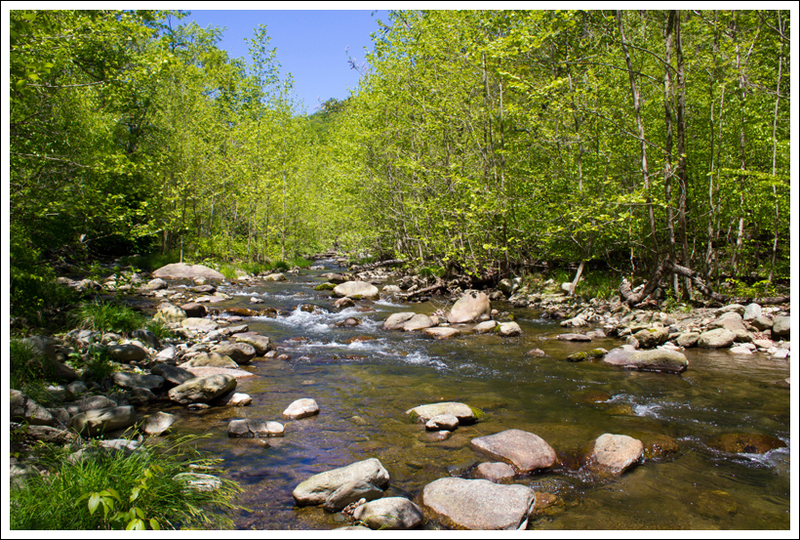 The hike starts off on the Graves Mill Trail, which is a flat walk that runs along the Rapidan River. At .5 miles, you reach a junction with the Staunton River Trail. Take a left at the junction to follow the Staunton River Trail, which runs along the Staunton River. Shortly after you join the trail, you will come across a beaver dam on the river and you’ll notice several stumps of trees that have been gnawed by beavers. 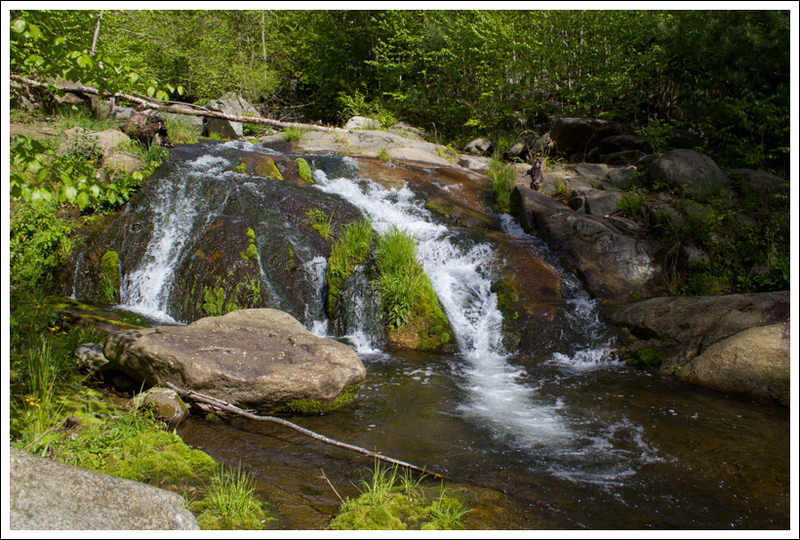 At 1.1 miles, you will see a small waterfall leading into a small pool off the trail that is worth a stop. At 1.8 miles, you will see on the left side of the trail some piles of stone and on the right you’ll be able to see another small waterfall through the trees. At 2.7 miles, you reach the junction with the Jones Mountain Trail. Take a left on this trail. The trail becomes very steep at this point and will remain so until you reach the top. At 3.1 miles, you reach the junction with the McDaniel Hollow trail. Take a left here to follow the Jones Mountain Trail. At mile 3.4, you reach a junction that leads to the available-to-rent PATC cabin. 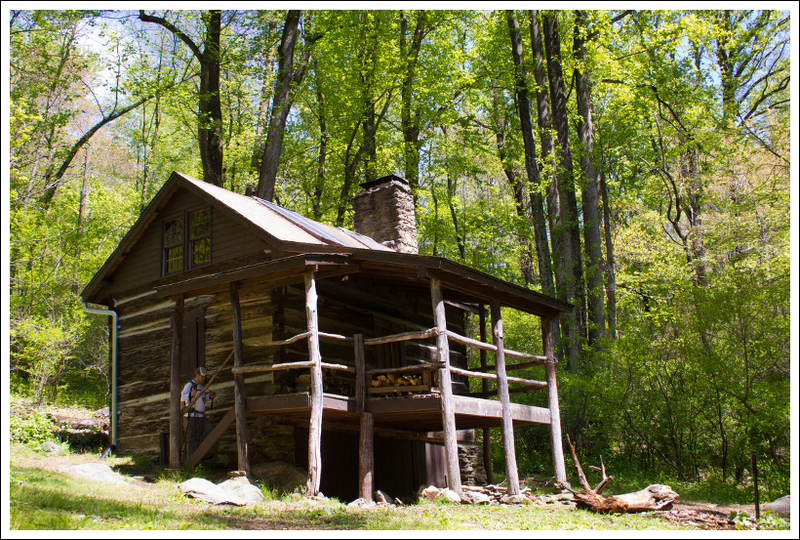 If you stay relatively straight on the trail, it leads to the PATC Jones Mountain Cabin. We took this trail which starts off flat, but then descends rather steeply. After visiting the cabin, return to reach the junction with the Jones Mountain Trail and head up the steep incline until you reach Bear Church Rock. Continue back the way you came, but your return trip will be shorter if you have already visited the Jones Mountain Cabin. The total trip should be 8.5 miles. 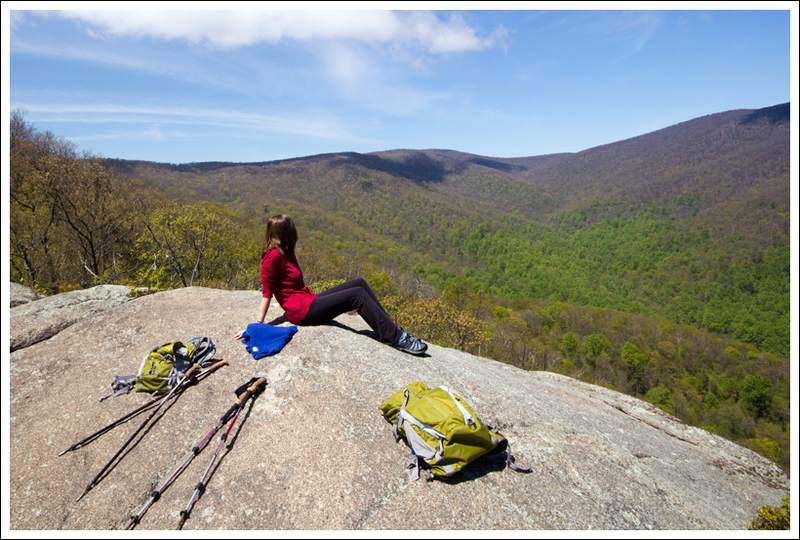 You could also approach this hike from Skyline Drive for a longer hike, following the Laurel Prong Trail to Cat Knob Trail to Jones Mountain Trail. My guess is it would be about a 10 to 12-mile round-trip to approach it from that direction. 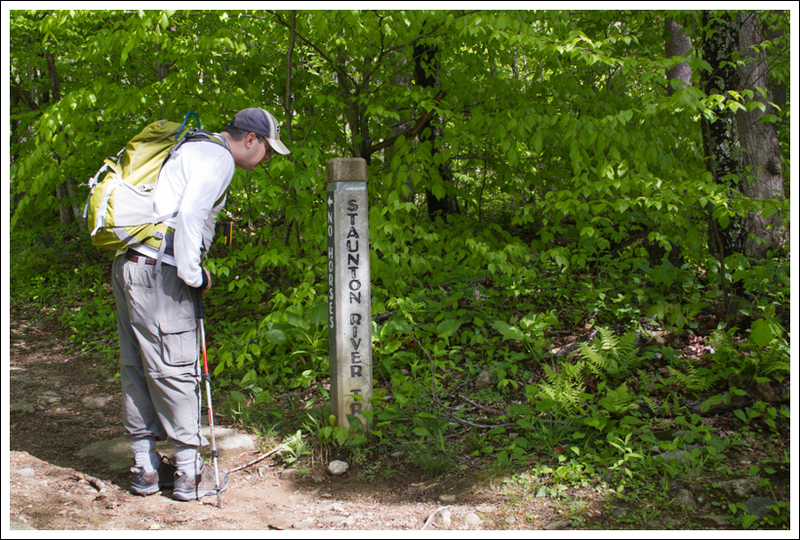 Adam pauses to look at distances marked on the Staunton River trail sign. 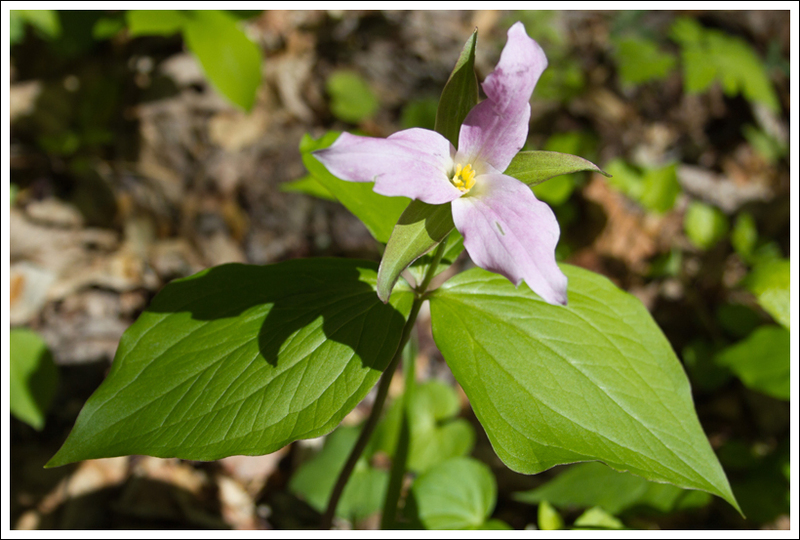 Below: Parking for this hike is at Graves Mill; The lovely Rapidan River; Trillium were still blooming along the trail, but were nearing the end of their peak. On our way up the Jones Mountain Trail, we ran into a few PATC volunteers that were working on maintaining the trail. 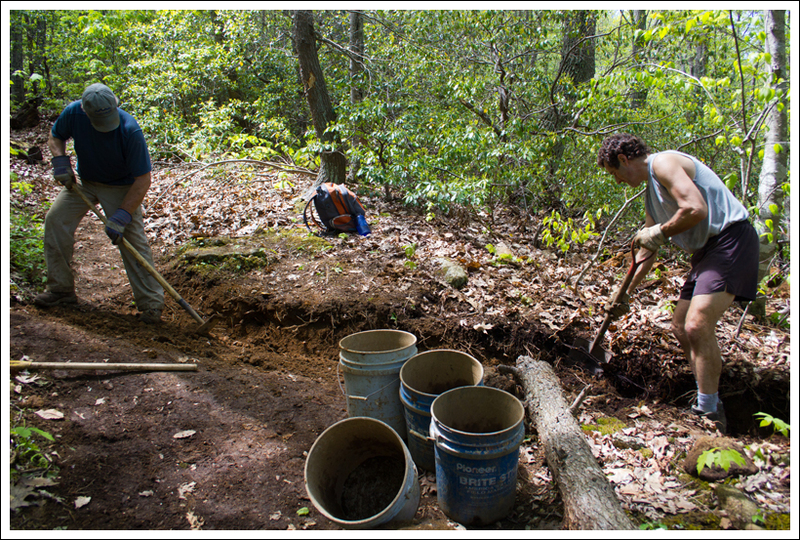 Some PATC members volunteer to help maintain the trails that run through Shenandoah National Park, the Appalachian Trail, and other regional trails. One of the workers has been working on improving this trail for the last five years. At the time that we saw them, they were working on building in some water bars through the trail that helps pull the water off the trail to prevent erosion. They were digging drainage ditches, placing some dead black locust tree logs across the trail they had cut, refilling with dirt, and then mounding the dirt in a way that it was unnoticeable to hikers. We learned that the black locust trees were great trail logs because they don’t rot. We thanked them for helping to improve the trails and we plan on getting in touch with them to help them some weekend in the future. We both feel that as much as we enjoy hiking, it would be nice to give back. This was the first of many small waterfalls we saw along the Staunton River trail. Below: Another waterfall; There were many remnants of stone walls and stone structures in the woods along the trail; Adam stops to consult the map at the junction of the Staunton River and Jones Mountain trails. At one moment when we were hiking up the Jones Mountain Trail, I decided to take a break from the climb and sat on a log on the side of the trail. 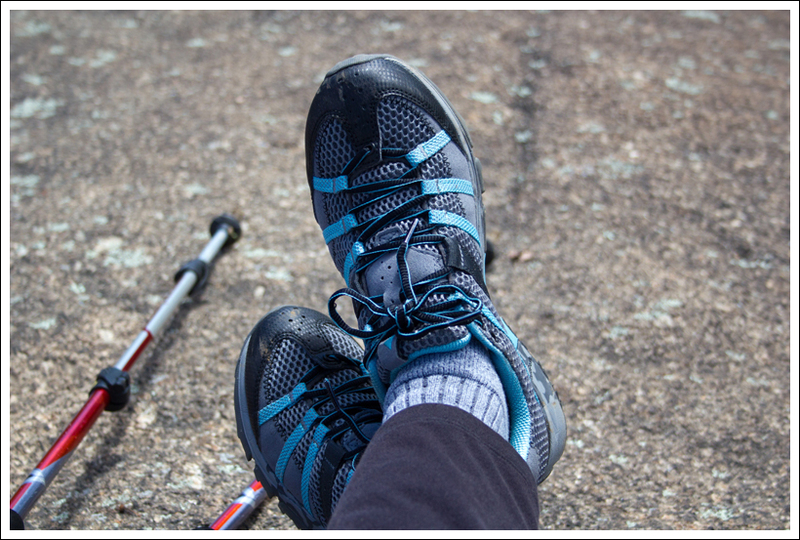 As I was relaxing, a piece of the log broke off, causing me to hit myself in the head with one of my trekking poles. I felt like I was in the Subway commercial of fat people breaking things. Embarrassing, but funny. This was our first time hiking this trail, but Christine and I both think this is one of the best trails in Shenandoah National Park. If you can handle the distance and the steep climb, this should be on your “must” list. For further reading about this area, check out Lost Trails and Forgotten People: The Story of Jones Mountain. I think I would like to pick up a copy and learn more about this area, since it was such an amazing hike. Another weekend, another backpacking trip cancelled due to rainy weather – what can I say? When you’re a fair-weather backpacker, lots of spring trips end up delayed. We were pretty glad we postponed again, because the thunderstorms that passed through overnight on Saturday were pretty fierce and torrential. I would not have enjoyed being in our tent during those winds and rains! Fortunately, Sunday morning dawned dry, but foggy with a forecast of dissipating clouds followed by brilliant sunshine. We decided to tackle the 8.5 mile route up Jones Mountain to Bear Church Rock. 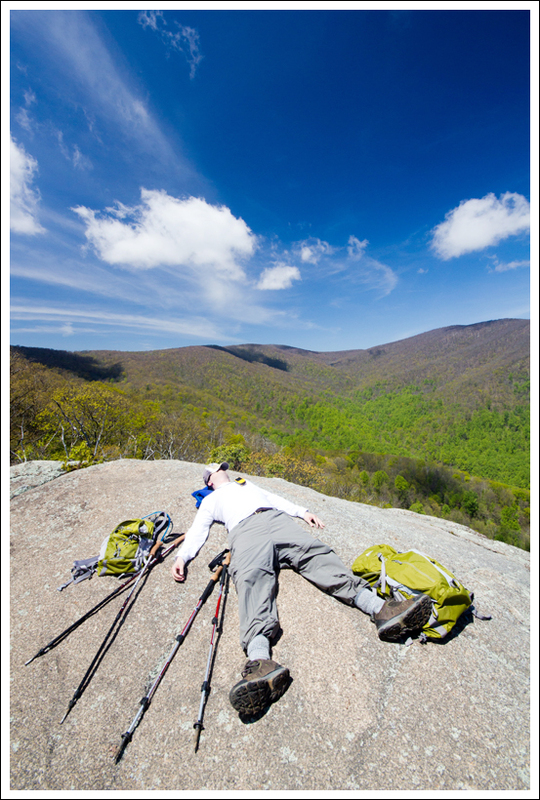 It’s a hike we’ve been meaning to do, especially after seeing it covered by PATC – Charlottesville Chapter and Hiking Upward. The hike vastly exceeded my already high expectations. I had the BEST time! 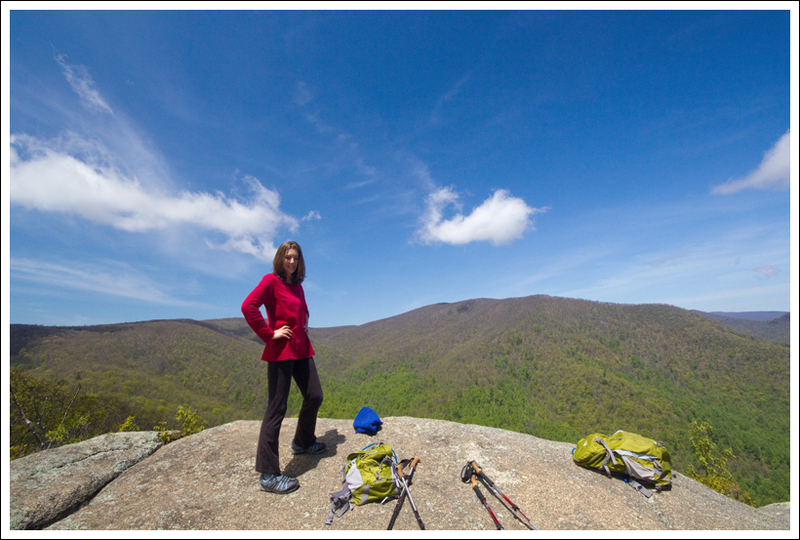 Without a doubt, this hike has cracked my top-five list of hikes in Shenandoah National Park (along with Riprap, Mary’s Rock from Pinnacles, Rapidan Camp and the Rose River Loop). This hike had it all – gorgeous river scenery, waterfalls, fantastic trail conditions, a rustic cabin, spectacular views and plenty of opportunities to spot wildlife. We saw this impressive beaver dam on the Staunton River. There were lots of gnawed trees (inset) around the water. 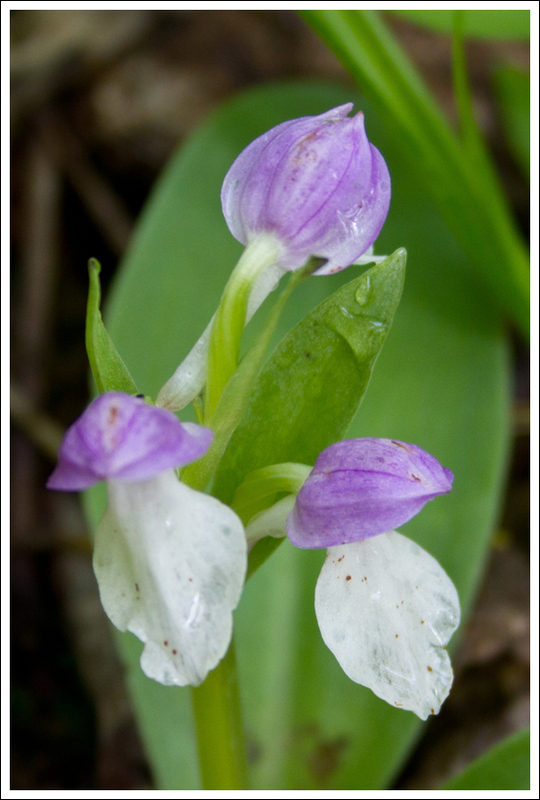 Below: Showy Orchis is a common wildflower seen blooming along the trail; Everything was so lush and green; You may notice Adam’s pants tucked into his socks to avoid ticks. Ticks are out in force this year! We started out around 10:00 a.m. from the Graves Mill parking area. The lot is small; with room for about 8-12 cars at most. It was already mostly full when we arrived. 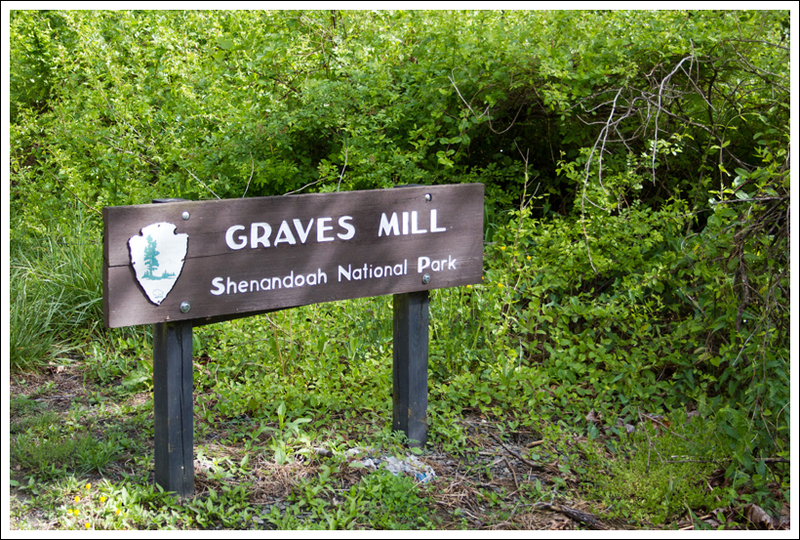 The hike starts off on the Graves Mill trail – a flat section of trail running parallel to the Rapidan River. Within a half mile, the Graves Mill trail meets the Staunton River trail. 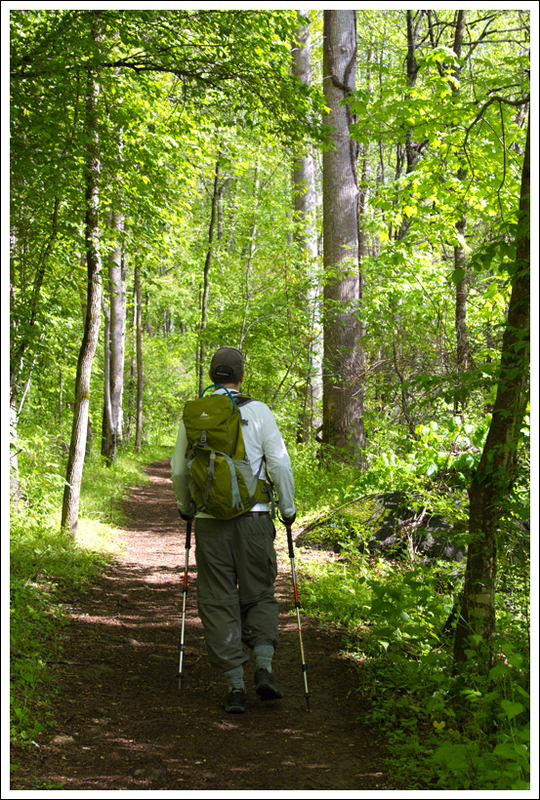 This trail is a gentle uphill grade, following within sight or earshot of the water. One of the first interesting things we passed was a series of several beaver dams spanning the river. I don’t know if they’re active dams or long abandoned. 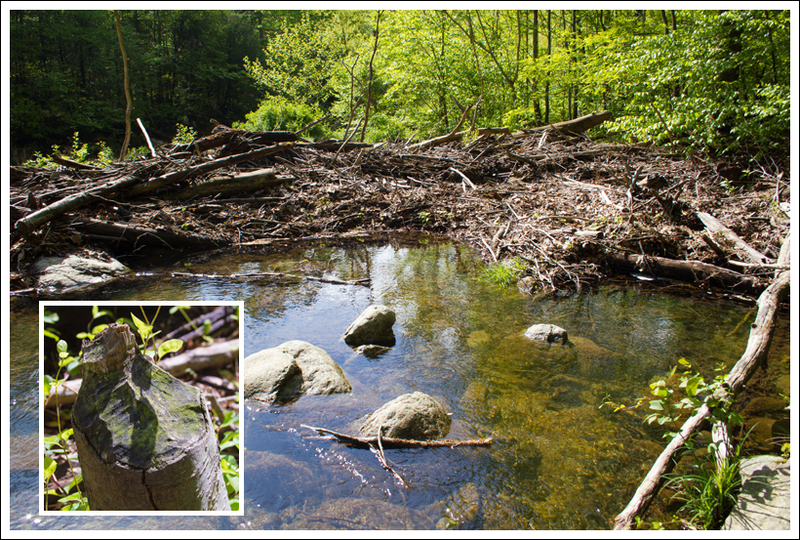 We saw plenty of gnawed tree stumps, but no sign of beavers or any fresh activity. A little further upstream, we passed the first of a series of small waterfalls. 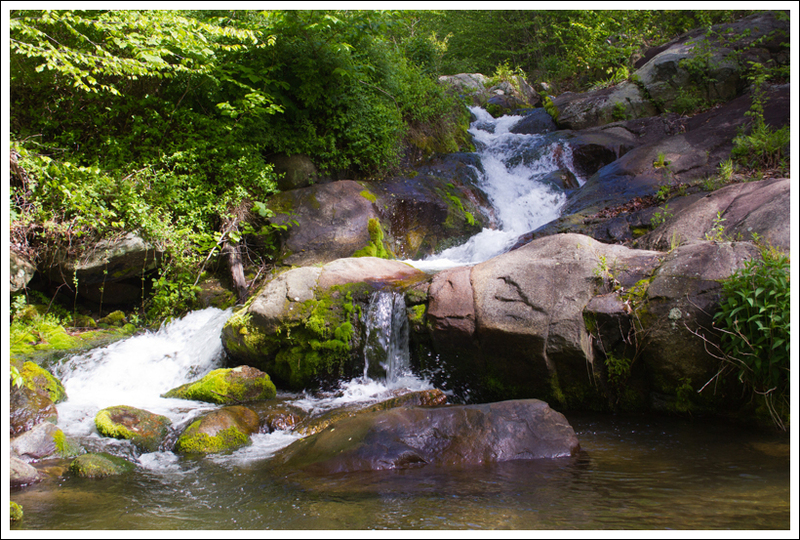 All of the falls and cascades along the Staunton River are beautiful! If you’re a photographer and like shooting long exposures on moving water, this river is a goldmine. I’d love to return on an overcast day after there has been plenty of rain. I think this trail would also be popular with people in search of the perfect summertime swimming hole. There were so many deep, quiet pools between the faster moving cascades. 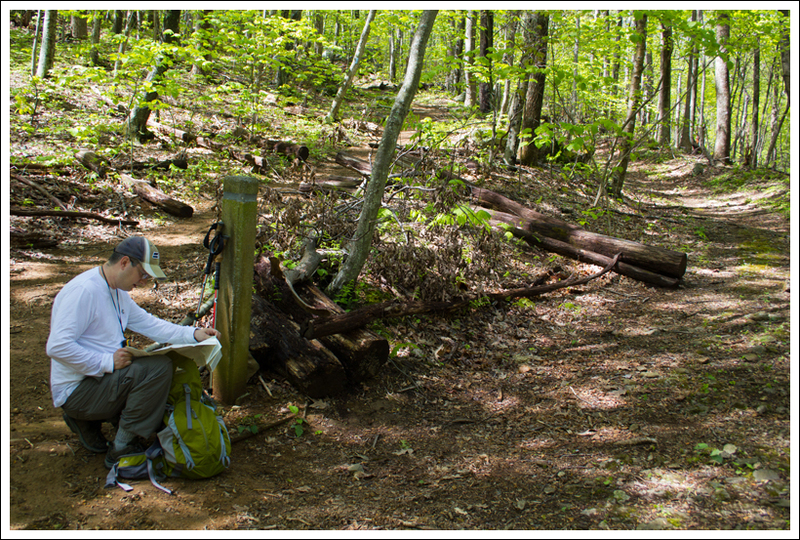 After about a mile and a half along the Staunton River trail, we reached the junction with the Jones Mountain trail. Adam took a brief break at this point to consult the map. We quickly figured out that we were about to start climbing. Overall, the path to Bear Church Rock requires about 2200 feet of elevation gain. PATC volunteers have been working on the trails in this area for over five years, spending 1000+ hours of their time. After just a few minutes of walking, we heard voices and the sound of tools coming through the woods. Shortly later, our paths crossed with a PATC trail crew hard at work installing water bars. We learned from the crew that they’ve done over 1000 hours of work on this particular section of trail over the past five years. No wonder the trail is in such magnificent shape. Everyone who hikes in Shenandoah and enjoys the fantastic trail conditions owes a debt of gratitude to volunteer trail workers. They do mind-boggling amounts of backbreaking labor to make the trails nice for everyone else. After chatting with the trail crew for a few minutes, a couple came down the trail. They mentioned that they had seen a bear with two tiny cubs just a few minutes earlier. We were excited and hopeful that we might spot them too. Unfortunately, we weren’t that lucky! Eventually we reached a ‘Y’ in the trail, with one arm leading .3 of a mile down to the Jones Mountain cabin and the other arm leading a half mile up to Bear Church Rock. We decided to visit the cabin first, and then enjoy lunch atop Bear Church. The trail to the cabin led rather sharply downhill, first passing through an ancient, gnarled stand of mountain laurel. The curly branches practically formed a tunnel over the trail. All along the final descent to the cabin were stacks of firewood – also courtesy of PATC trail crews. Apparently, there is a significant problem with cabin renter chopping down live trees near the cabin to use as firewood. I find that SHOCKING! What is wrong with people? Who goes to a National Park… and chops down living trees (especially when deadfall is so abundant in the park)? The Jones Mountain cabin sits in a peaceful opening in the woods. 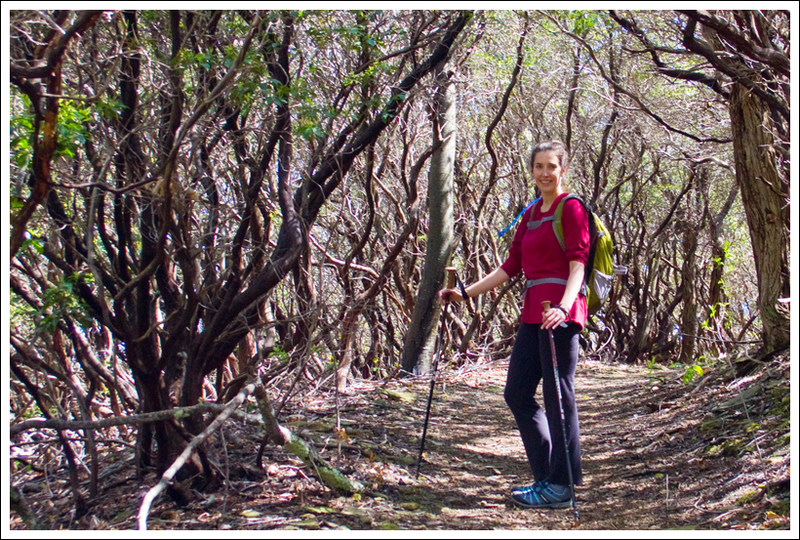 Below: Christine walks through a tunnel of ancient mountain laurel on the path down to the cabin; Christine has new hiking shoes – Montrail Mountain Masochists (very comfy! ); Christine enjoys the wilderness views from the rock. After rounding a final bend, the roof of the cabin comes into view. The Jones Mountain cabin is adorable – two stories with a big front porch. We peeked in through an opening in the shutters and saw a big fireplace, a rustic wooden dining table and a sunny loft on the top level. A privy and a spring are both located near the cabin. What a great place to hike in and camp for a couple nights! We didn’t stay long at the cabin because we were hungry for lunch and wanted to enjoy Bear Church Rock before any other hikers arrived. The climb back up to the trail junction was pretty steep, but didn’t take too long. The toughest climbing of the day came along the final push up to the rock. After a few switchbacks, the trail went straight up the mountainside. 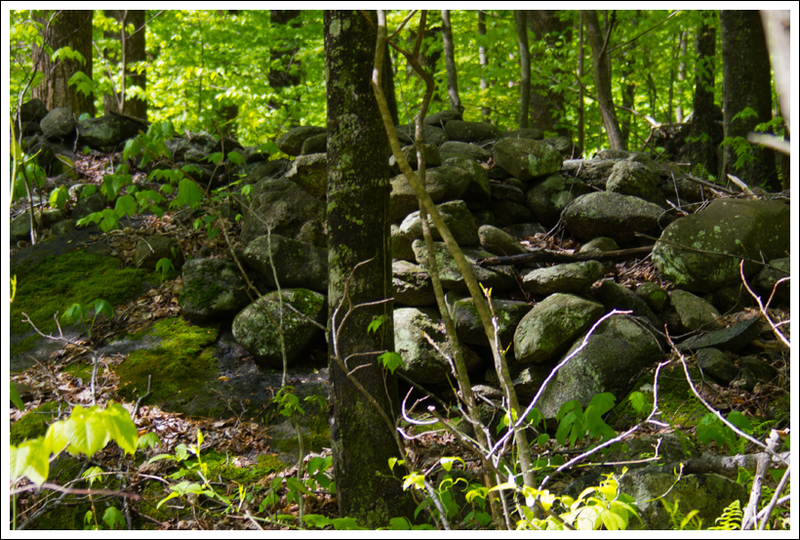 At the top, a little unmarked (but highly visible) path cuts through the vegetation onto a large rocky outcropping. The trail continues past the little spur trail to the rocks, so don’t miss it! If you continued along the trail, you’d eventually come to trails in the vicinity of Camp Hoover. The view from Bear Church Rock is fantastic! Instead of looking down into a valley full of roads, farms and small towns, you look down into wilderness. You see nothing but trees and a line where the river cuts through the forest. 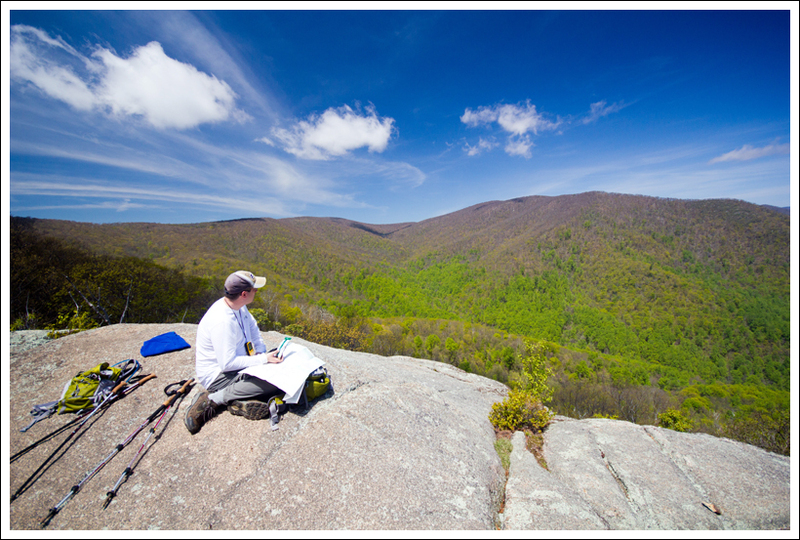 If you have a map, you can identify some of Shenandoah’s other peaks from this spot. We hit this spot on a perfect spring day. We had bluebird skies with only occasional puffy clouds. The progression of spring was evident in the mountains – vibrant green climbing its way up toward the still barren mountain tops. We enjoyed our lunch and relaxing in the sunshine. Just some more beauty shots from atop Bear Church Rock. The hike back down went quickly – with a descent so steep it was easier to run than to walk! We made the return trip to the car in about half the time it took us to climb up. In the end, the entire hike took us about four hours, including stops at the cabin and half an hour for lunch. Bear Church Rock is definitely worth doing! What a beautiful day! Difficulty – 4. The parts near the Rapidan and Staunton Rivers are very flat, but the uphill climbs are very steep. Trail Conditions – 4. The trail is wide during much of the trail where you could even walk side-by-side with someone if you wanted. 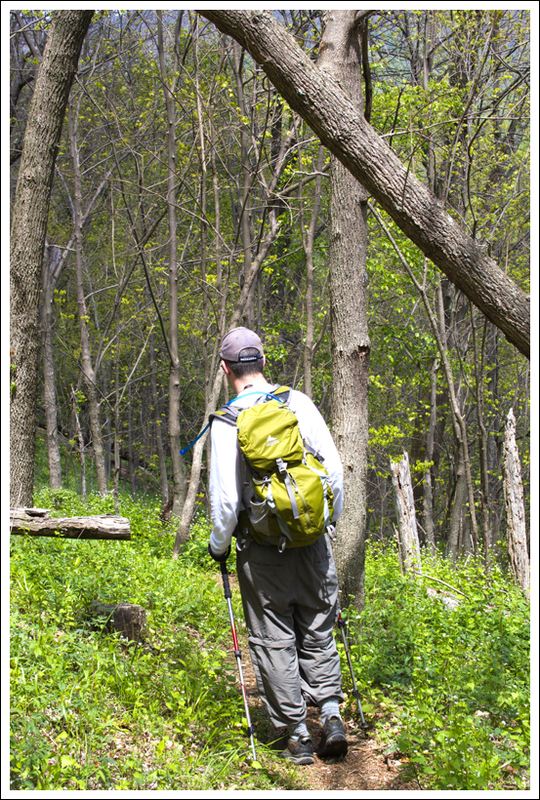 The trails are well-maintained thanks to our PATC volunteers and it is not very rocky through most of the hike. Views– 4. The view from Bear Church Rock is amazing. It’s not a 360-degree view, but you can see mountains for miles and little sign of civilization. Streams/Waterfalls – 4.5. The rivers are nice to walk alongside. You also have a beaver dam and a few small waterfalls on this trail. Wildlife – 4. We saw some snakes by the river and on the trail. We saw deer by the Jones Mountain Cabin. People coming down the trail when we were coming up had just seen a mama bear with two cubs. Ease to Navigate – 4. While the trail does have a few turns, it is well marked with concrete posts to help give you direction. Solitude – 3.5. We had the view to ourselves by going early in the day, but this is a fairly popular hike. 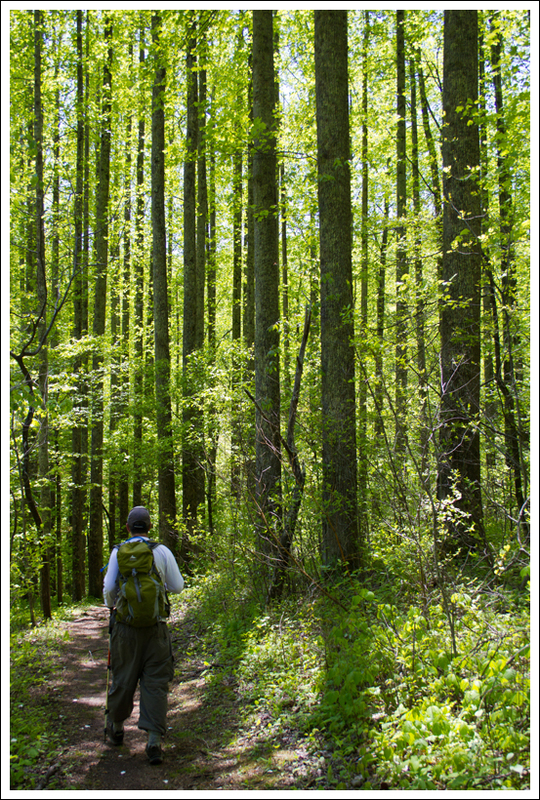 Directions to trailhead: From Route 230 near Wolftown, VA turn on to Route 662. Continue to follow the signs for 662. In about 6 miles until 662 ends at a parking lot. The trailhead is visible from the parking lot. I don’t remember there being any significant crossings, but the early part of the hike runs along the river – so the trail could be very wet in places. Whats the best way to get to do this hike from inside the park ? I’m camping at Big Meadow and would like to access the trail from Skyline drive.. Appreciate any help. I did this hike on this unusually cool summer afternoon (mid 70’s). It lived up to the description above. Keep up the good recommendations! Thanks for the visit, Ian! It’s so great to have a surprise cool summer day for a hike like this. This trail sounds great! And I love the picture of the cabin. My boyfriend and I would like to take our dogs. The cabin is pet friendly; I want to make sure the trail is also. We have large, active dogs that have been hiking with us. I just worry about rock scrambles, etc. Thanks for your input! Hi Jen! The trail should be totally fine for your large, active dogs. I would actually even feel fine bringing my youngest pug along on the hike! Excellent review, and thanks for your nice site. I have followed several of your recommendations, including Mary’s Rock. I am going to do this one tomorrow, been looking for a new one in this area. Looks to be a great day. Keep up the good work. Thanks for the visit, David! Oh… that stinks about the wood! The trail maintainer we talked to said the cabins all get a fair amount of abuse from visitors who don’t care about preservation or respecting others. They’re mainly there to party in the woods. I bet Jones Mountain Cabin is checked on less frequently than the cabins closer to Skyline Drive. Great writeup. I’ll have to do the trail again when the leaves are out, as it has been a winter hike for me. In fact, the last time I did it during the warmer months it was so long ago that I vividly remember being impressed that one of my fellow hikers could pull a phone out of his backpack and call home! Not a big fan of the Jones Mtn Cabin, as I went there a couple of Decembers ago only to find out the previous renter left the cabin with soggy wood. And because you cannot arrive until after 3 PM the first night, there is little time in the winter to collect enough dry wood to heat the cabin. I woke up the following morning next to a frozen water bottle. This is a nice write-up of Bear Church Rock, Christine and Adam. Great pictures, too. They remind me of some of my favorites of yours from over the years, Christine. It must be those impossibly beautiful blue skies and wide angles. I’m glad Adam didn’t hurt his head too bad.